Weber introduced the Genesis II E 410 in 2017 and it was a game changer. The 410 was a massive four burner grill that demanded attention. When the 410 came out it was just about perfect. In 2019 Weber came out with a properly upgraded version, the 435, that just might be perfect. 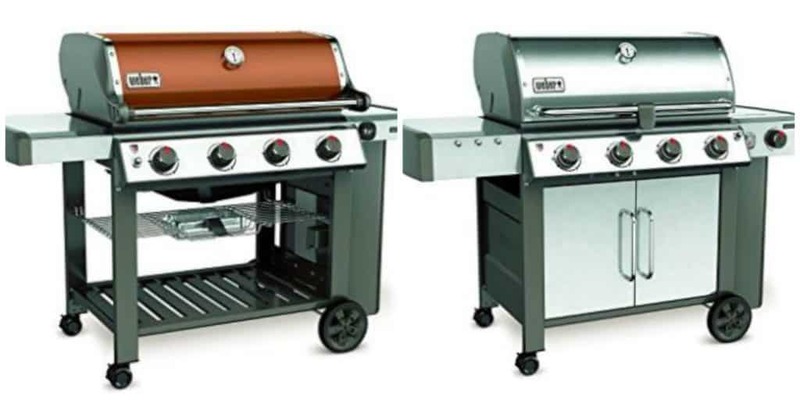 The 410 and 435 grills are the same size and share many details in common. Here are the features that these grills share. 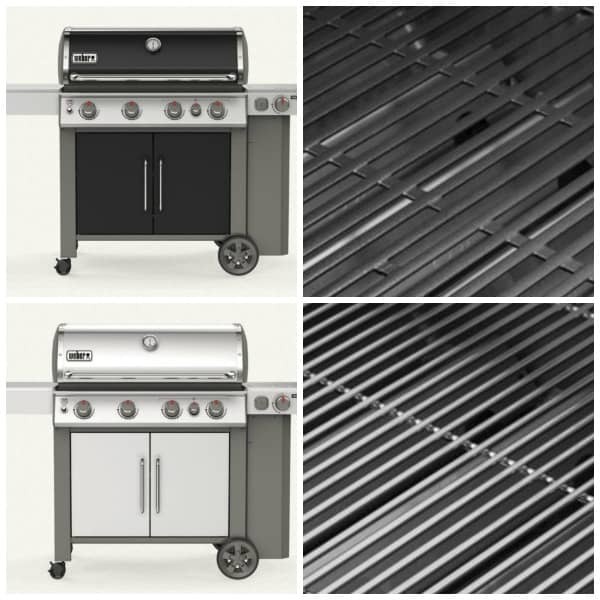 Heating Power: (48,000 BTU/hr) / (646 square inches) = 74 BTU per hour per square inch of grilling space. The extra colors are available for propane fueled grills. The natural gas grills are only available in black. While I loved the 410 when it first came out there were a few things that had some people complaining. One issue is that this beast of a grill did not come with a side burner. I hardly ever use a side burner so I didn’t care but other folks took the stance that if you are going to spend around a thousand bucks on a grill then it dang well better have a side burner. I can see their point. To get a side burner on a 400 series grill you had to pay for an enormous upgrade to the now discontinued LX series. The problem with the LX series was, while it came with a side burner, it did not come with a Sear Station burner which should have been an automatic upgrade at that price point. If you are not familiar with Weber products, then the Sear Station is an extra burner (#5) inside the main grill body that you crank up when you want to get a serious crusty sear on steaks, pork chops, burgers, etc. You certainly don’t need a Sear Station burner for everyday grilling but oh my goodness it really makes a difference for steaks and is a awesome feature to have at your disposal. Weber listened to the customer feedback and, in 2019, killed off the underwhelming LX and replaced it with the 435 models that had both a side burner and a Sear Station. There are two versions of the 435, an E and an S model. The most obvious difference between the two is that the lid on the E 435 is black porcelain enameled steel while the S 435 is stainless steel. The MAJOR difference between the S and E 435 models is actually the cooking grates. The cooking grates on the S 435 are made from 7mm diameter rods of stainless steel compared to porcelain enameled cast iron on the E 435. I LOVE the stainless steel rod cooking grate on the S 435. Make better grill marks than the cast iron grates. Are super easy to clean. Will last longer than the cast iron grate. The 7mm rods are only slightly less thick than the 9mm rods on the ultra high end Weber Summit grills. They are a serious upgrade. Okay..That is the update for 2019. Below is the rest of the original review I put together for the other four burner grills offered by Weber. Here is a nice video walk through of this grill that Weber put together. I pulled some snapshots of the reviews that have been posted for the the 410 over on the Weber and Lowes websites. Here are the reviews that have been posted as of 7/6/2018. 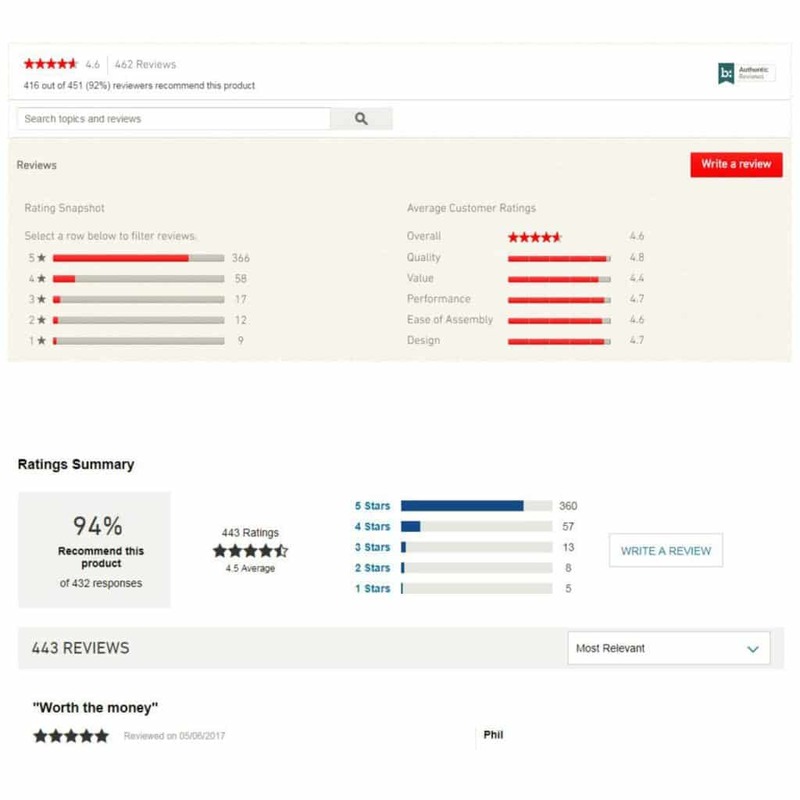 The reviews between the two sites are extremely consistent. On Weber’s site 92% of owners would recommend this grill which received an overall 4.6 star rating. On Lowe’s site 94% of owners would recommend this grill which received an overall 4.5 star rating. I was surprised when I saw the star ratings for this grill on Amazon as there were quite a few bad reviews. Weber products usually have extremely positive reviews so something was up. It turns out that most of the negative ratings concerned the “Expert Assembly” feature that you can purchase from Amazon. It looks like a few folks were never contacted for the Expert Assembly or had a poor experience with the service provider. I can certainly understand why folks would leave 1 and 2 star reviews about not receiving a service they paid for. If you ignore all of the reviews about “Expert Assembly” then this grill gets the same type of overwhelmingly positive feedback that you see for other Weber products. What I love about this grill. I love the 410 because it scratches the biggest itch I have ever had with Weber’s gas grills. I always wanted something “More” but didn’t want to spend a fortune. Let me explain. Before the introduction of this grill the best Genesis that you could buy was a three burner grill. The three burner Genesis grills are fine but there really isn’t a lot of difference between them and a three burner Weber Spirit grill. In a head to head battle of Weber Spirit vs Genesis I always gave the advantage to the Spirit based on value. If you wanted to step up and get something seriously better than a three burner Spirit then the only real option was to spend a boat load of cash (thousands!) and get a four or six burner Summit. The Genesis II 410 solves this problem! The four burner Genesis 410 is a SERIOUS upgrade over the three burner Spirit grills and only costs a fraction of what you would pay for a Summit. Oh yeah….the different color options are beautiful. What I do not like about this grill. The Warranty: The 10 year full component warranty on this grill is amazing. Weber has finally addressed the biggest weaknesses of their product (the ignition system) and upgraded it from 2 years of coverage to 10. What I do not like about the warranty is that there is a LOT of confusion about the coverage. The Genesis II E 410 has porcelain enameled cast iron grates and Flavorizer bars. I have talked to two different retailers at specialty grill stores and they both told me that the grates and Flavorizer bars are only covered for 5 years. The 5 year coverage for these two parts is also explicitly stated on page 8 of the hard copy of the Owner’s Manual that comes with the grill. However, Weber’s marketing videos explicitly state that ALL components are covered for 10 years (check it out at the 3 minute mark in the video above). The 10 year compete coverage for ALL components is also stated in the ONLINE Owner’s Manual for this grill as well as in the general warranty section of their website. I have called Weber Customer Service two different times and spoke with two different representatives. Both representatives told me that the hard copy Owner’s Manuals are outdated and no longer correct. They stated that the online manual is the most current and that the 10 year warranty on all components is correct. Since these grills were only recently introduced and are built like tanks it will be a few years before people start making claims and we finally figure out if we are getting five or ten year coverage. Assembly: Weber estimates that it will take about four hours to assemble the grill. I have personally assembled a bunch of Weber grills over the years and can get one put together in about two and a half hours. The instructions are pretty simple to follow but there is a lot of stuff to put together. It makes for a long afternoon. IGrill 3: The iGrill 3 is a nice dual probe wireless thermometer that lets you track the internal temperature of the meat you are grilling on your phone. These grills are marketed as iGrill 3 compatible and have a little iGrill 3 emblem. It kind of makes you think that it comes with an iGrill 3……but it doesn’t. The iGrill 3 is sold separately. This isn’t a huge deal but it just bugs me. There is another version of the 410 available that causes a little confusion called the Genesis II SE 410. The “SE” in the name refers to “Special Edition”. The Genesis II SE 410 costs about $50-$75 more than the E 410 and comes with stainless steel grill grates and stainless steel Flavorizer bars. The SE version also has a Special Edition badge on the right side grill table. Here is a video from BbqGuys that shows the detail of the SE 410. The only place you can buy a Special Edition grill is from a certified Weber Alliance retailer. This is a little perk that Weber gives its retailers to help them compete against Big Box stores and Amazon. The Genesis II LX S 440 is an upgraded version of the E 410 that I do not recommend but understand why people will buy one anyways. That is a LOT of extra upgrades and the LX S 440 is beautiful. The LX is also expensive. I do not recommend this grill from a value standpoint. All of the extras and upgrades are nice but they are largely cosmetic and do little to upgrade the actual practicality and performance that you get with the base model 410. The Genesis II E 410 is such a game changer that it makes the Summit S 420 completely irrelevant. The Summit S 420 has been around for years and was the least expensive four burner Weber gas grill that you could buy. That title now belongs to the Genesis 410. 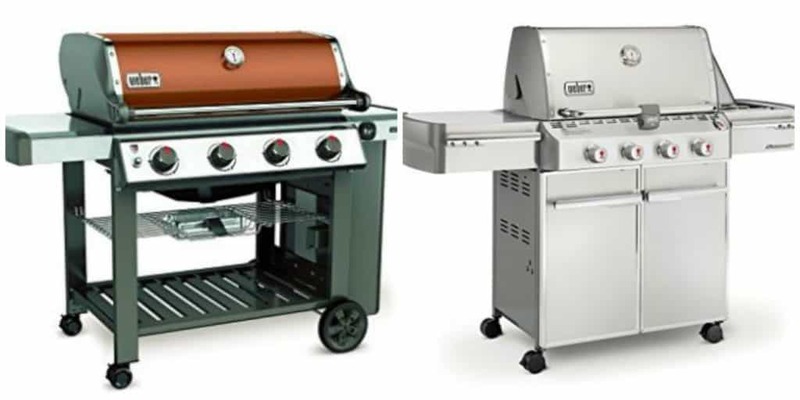 The Summit 420 has less grilling area than the 410 (538 vs 646 square inches) and costs a heck of a lot more. If you want the stainless steel look of the Summit 420 then go with the Genesis II LX 440 instead. Okay, this is not really a fair comparison based on either features or value. 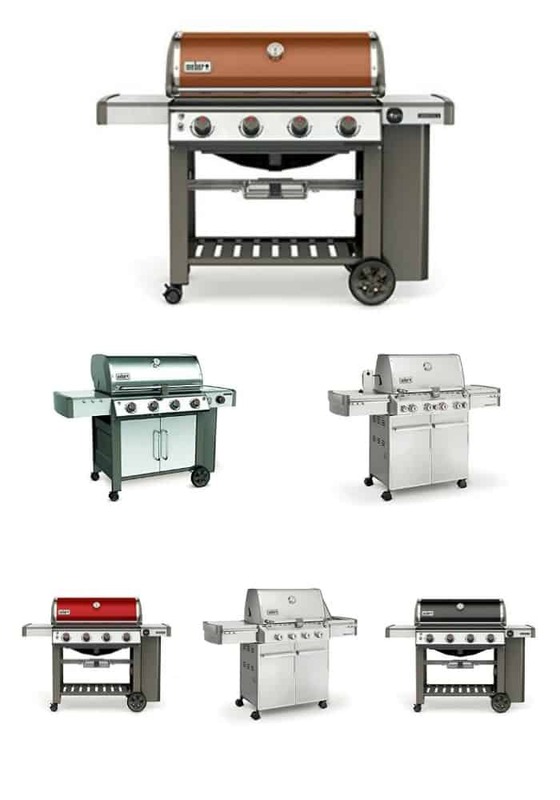 The Summit S 470 is the pinnacle of four burner grills and has every piece of grill bling that Weber has to offer. The Genesis II E 410 is an everyday work horse. It is a beautiful, no frills monster of a grill. The Summit S 470 is something you buy because you can. All of these extra burners and features come with a hefty price tag but this is what you buy when you want the best four burner gas grill available. Thanks for the summary and comparisons. What can I cook on an E-410 that I couldn’t on a 310? There isn’t anything that you couldn’t cook on a 310 that you could cook on the. The 410 will make it easier to do low and slow indirect cooks though. With the 410 you could put a 15 pound brisket in the middle of the grill with the middle burners OFF and use the two outside burners on LOW to dial in a temp of 275.